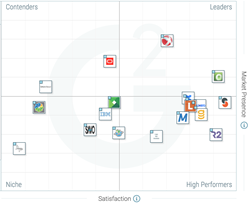 G2 Crowd, the world’s leading business software review platform, today released the Winter 2018 Enterprise Content Management Software Grid® report to help businesses make the best enterprise content management technology buying decision. OnBase by Hyland, DocuShare, Seismic, and Confluence were named Leaders in the report, receiving a strong customer satisfaction score with a large market presence. Nuxeo Platform, Laserfiche, SpringCM Contract Management, R2 Docuo, M-Files, and FileBound were named High Performers in the report, earning strong customer satisfaction marks with smaller market presence scores. Seismic received the highest overall satisfaction score while DocuShare earned the highest overall market presence score. The Grid® leverages customer satisfaction data reported by authenticated users along with vendor market presence determined from social and public data. Based on a combination of these scores, each software solution is categorized as a Leader, High Performer, Contender or Niche. Data retrieval - Enterprise content management products are often the centralized source of information and documents within a company. Users noted that a feature that ensures user satisfaction is easy and efficient data retrieval. With systems that are often complex and loaded with information and data, users expressed the importance of easily finding exactly the information you want. Room for growth - The majority of reviewers expressed dissatisfaction with steep learning curves, slow processing, and outdated interfaces. Enterprise Content Management is a growing category, and products, both on the Grid® and ones still gathering reviews, might be able to gain an edge on the competition by focusing on interface, speed, and simplicity. The report is based on more than 522 reviews written by business professionals. Of the 98 products listed in G2 Crowd’s enterprise content management category, the ranked products each received ten or more reviews to qualify for inclusion on the Grid®. G2 Crowd, the world’s leading business solution review platform, leverages more than 225,000 user reviews to drive better purchasing decisions. Business professionals, buyers, investors, and analysts use the site to compare and select the best software and services based on peer reviews and synthesized social data. Every month, nearly one million people visit G2 Crowd’s site to gain unique insights. Co-founded by the founder and former executives of SaaS leaders like BigMachines (acquired by Oracle) and SteelBrick (acquired by Salesforce) and backed by more than $45 million in capital, G2 Crowd aims to bring authenticity and transparency to the business marketplace. For more information, go to G2Crowd.com.